Swiss born Elisabeth Levy immigrated to the United States in 1958. She married Dr. William Levy, whom she met while working as an RN in his dermatology practice. Her journal begins in 1981, when they take a business/tourist trip to China. They continued their travel adventures together, until he passed away in 2005, and Elisabeth carried on that tradition, usually taking business and humanitarian related trips until 2013. 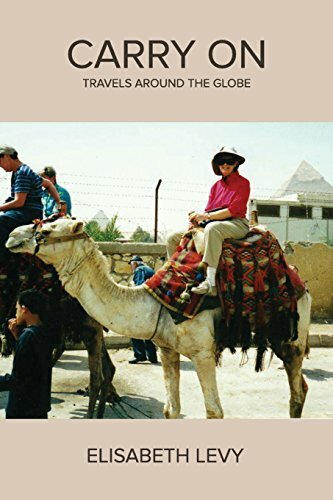 In “Carry On,” she shares her travels that take her to all seven continents and even a trip around the world in 60 days! Elisabeth shares beautiful color photographs that help illustrate her story. Some of these pictures are heartwarming ones of the local people that she meets on her journey, and some are heartbreaking, like the photo of a young male beggar suffering from leprosy. The photographs of the landscapes are amazing. It is wonderful to see pictures of places, people, flora, and animals that I am not likely to ever encounter in person. I also liked the descriptions of how the locals would relate to her. Most of the adventures in “Carry On” are positive, however, there are occasionally some difficult situations that really make one realize how vulnerable it can be when you are a tourist in other countries. "Carry On” is a wonderful book to read, especially for people who enjoy traveling or just reading about it! Elisabeth Levy writes directly to you as the reader, so that you feel like you are reading about the adventures of someone that you know personally. She has such a wonderful way with words; she draws you into the places that she is visiting. Breaking the book up into thirteen chapters keeps it well organized because each chapter represents a different trip. Not only does she talk about the destination of where she was traveling, but her experiences as she crosses through other countries to get there. “Carry On” is more than a travel journal; it truly reflects a labor of love.